John C. Oxley's Breeders' Cup Juvenile Turf (GI) runner-up Airoforce, shown in a victory in Keeneland's Dixiana Bourbon (GIII), is the 3-1 morning line favorite as he moves to dirt in Saturday's $200,000 Kentucky Jockey Club (GII) at Churchill Downs. 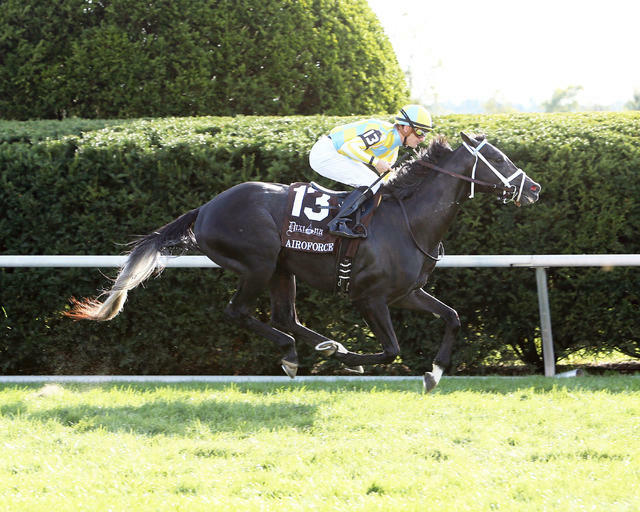 (Coady Photography, Keeneland). John C. Oxley’s Airoforce, the winner of Keeneland’s $250,000 Bourbon Stakes (Grade III) who was beaten a neck by fast-closing Hit It a Bomb in last month’s $1 million Breeders’ Cup Juvenile Turf (GI), was made the 3-1 morning line favorite for his dirt debut in a full field of 14 juveniles entered for Saturday’s 89th running of the $200,000 Kentucky Jockey Club Presented by TwinSpires.com (GII) at Churchill Downs. Saturday’s 1 1/16-mile race is the co-headliner on the penultimate day of the 21-date Fall Meet. Billed as “Stars of Tomorrow II,” each of the 12 races is exclusively for 2-year-olds that may have aspirations of trail-blazing their way to next spring’s Kentucky Derby Presented by Yum! Brands and Longines Kentucky Oaks. The Kentucky Jockey Club – a “Prep Season” race on the “Road to the Kentucky Derby” in which the Top 4 finishers will receive 10-4-2-1 points, respectively – goes as Race 11 at 5:35 p.m. (all times Eastern). First post is 12:40 p.m. The co-featured $200,000 Golden Rod (GII) for fillies is Race 9 at 4:35 p.m.
Airoforce landed post three under regular rider Julien Leparoux, and track odds maker Mike Battaglia made the Kentucky-bred son of Colonel John the favorite over California-based Mor Spirit (7-2), who won one-mile maiden race at Santa Anita in 1:37.48 for Hall of Fame trainer Bob Baffert, and New York-based Annual Report (5-1), the 1 ½-length winner of last month’s $200,000 Futurity (Grade I) at Belmont Park for trainer Kiaran McLaughlin. 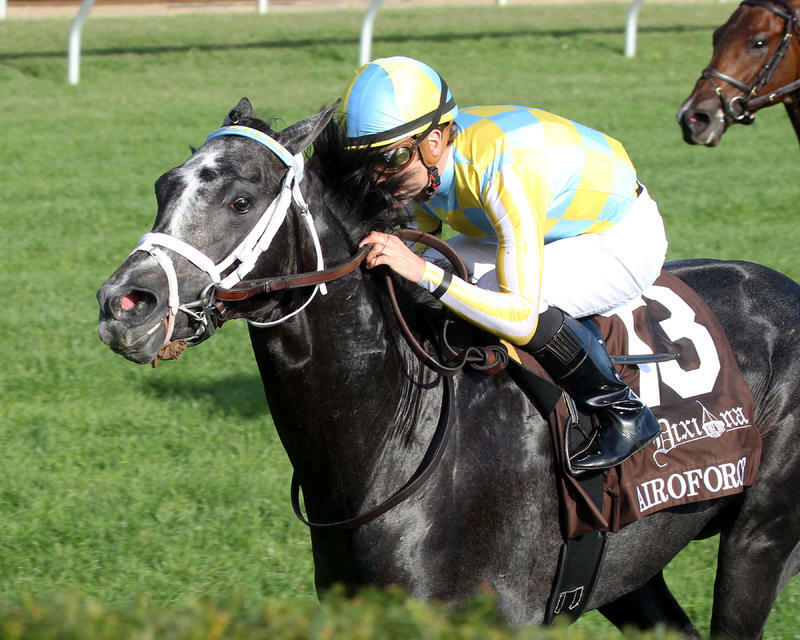 Airoforce (3-2-1-0—$402,000) and Annual Report (2-2-0-0—$170,400) are the lone graded stakes winners in the field of promising juveniles. Despite Airoforce’s tremendous success on grass, his connections have been keen to try top competition on the main track. Airforce, a gray colt, will race with blinkers for the first time in the Kentucky Jockey Club after sporting them during a half-mile breeze in company with barn mate Damascus Road on Nov. 20. Airoforce began two lengths back of his workmate and finished even after recording splits of :24.60 and :48.60. He galloped out five furlongs in 1:01 and three-quarters of a mile in 1:14. 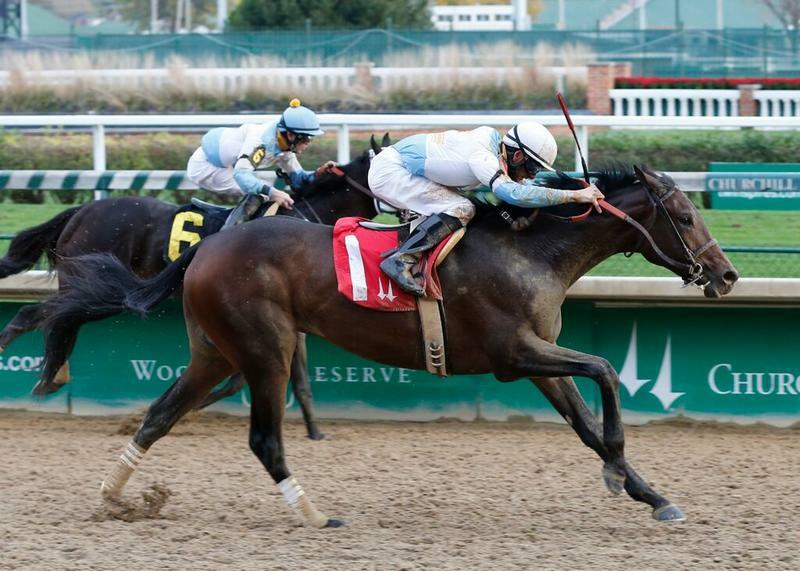 Oxley and the Casses teamed to win the 2012 Kentucky Jockey Club with Uncaptured, and Oxley has won the KJC on two other occasions with Jambalaya Jazz (1994) and Beethoven (2008). 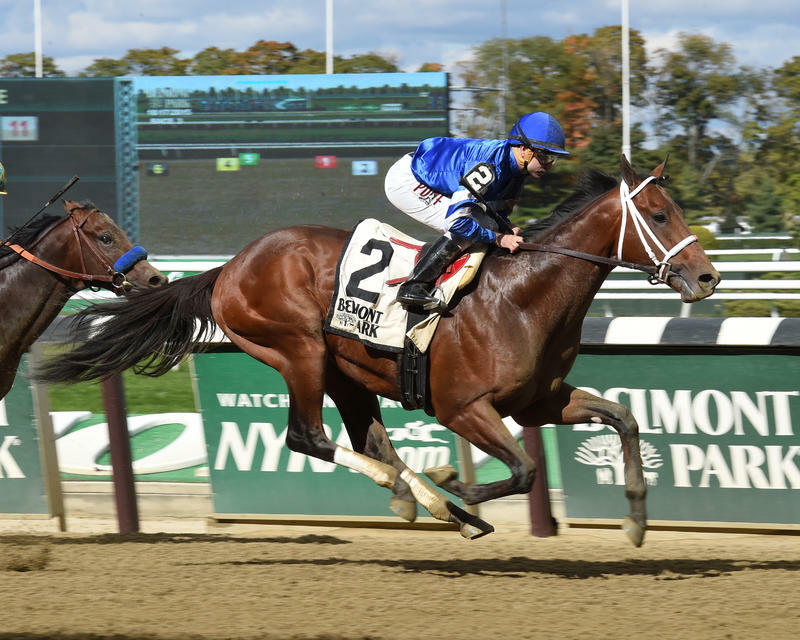 Godolphin Racing LLC’s unbeaten Annual Report, a Kentucky-bred son of the late Harlan’s Holiday out of the Seeking the Gold mare Pension, is already proven on dirt. He won the Oct. 17 Futurity at Belmont Park, clocking six furlongs in 1:09.82, and beat King Kranz that day, who returned to finish third in the $100,000 James F. Lewis III Stakes at Laurel Park on Nov. 14. Sent off as the second-longest shot in the field of six at 7-1, Annual Report was squeezed at the start and was taken back before rallying to overtake the leader at the three-sixteenths pole. Prior to that effort, Annual Report won a 5 ½-furlong maiden race at Parx on Sept. 20 by 5 ¼ lengths in front-running fashion. McLaughlin targeted the KJC for Annual Report’s first try around two turns to avoid a conflict with barn mate Mohaymen, the unbeaten Nashua (GII) winner who is entered to run in Saturday’s $300,000 Remsen (GII) at Aqueduct. Regular rider Joe Bravo has the mount and they’ll break the gate from post 11. Godolphin and McLaughlin will attempt to avenge a tough loss in last year’s Kentucky Jockey Club when Imperia finished a neck short of Zayat Stables’ El Kabeir. Michael Petersen’s Mor Sprit (2-1-1-0—$41,600) enters the Kentucky Jockey Club off a flashy 4 ¼-length maiden win around two turns at Santa Anita on Oct. 23. The Eskendereya ridgling has been favored in both of his two starts, and will attempt to give four-time Kentucky Derby winning trainer Baffert his third Kentucky Jockey Club triumph. He won back-to-back renewals of the race in 1998-99 with Exploit and Captain Steve, respectively. Mor Spirit drew post nine and Martin Garcia will taking over riding duties from Hall of Famer Gary Stevens. The Kentucky Jockey Club also attracted Radar Racing LLC’s Rated R Superstar, the Iroquois (GIII) runner-up and Breeders’ Futurity (GI) who was never a threat while 11th in the $2 million Breeders’ Cup Juvenile (GI) for trainer Kenny McPeek; G M B Racing’s duo of Mo Tom (trained by Chris Richard) and Tom’s Ready (Dallas Stewart), who ran 1-2, respectively, in the $81,750 Street Sense Overnight Stakes at Churchill Downs on Nov. 1; and Winchell Thoroughbreds and Three Chimneys Farm’s promising Gun Runner, who beat fellow KJC entrant Uncle Jerry by two lengths in a first-level allowance around two-turns at Keeneland for trainer Steve Asmussen. Asmussen has won the Kentucky Jockey Club twice before – Private Vow (2005) and Tapiture (2012) – while his chief assistant Scott Blasi won the race in 2006 with Tiz Wonderful. McPeek won the 2001 renewal with Repent. The complete Kentucky Jockey Club field from the rail out (with jockeys and morning line odds): four-length, first-level Churchill Downs allowance winner Force It (Emmanuel Esquivel, 20-1); two-time maiden special weight runner-up Nana Looch (Robby Albarado, 50-1); Airoforce (Leparoux, 3-1); Gun Runner (Ricardo Santana Jr., 8-1); 1 1/16-mile maiden winner Perfect Saint (Shaun Bridgmohan, 30-1); two-time runaway Indiana-bred stakes winner Derby Express (Malcolm Franklin, 15-1); Tom’s Ready (Brian Hernandez Jr., 15-1); first-level Churchill Downs allowance winner and Street Sense fourth Discreetness (Jon Court, 20-1); Mor Spirit (Garcia, 7-2); Mo Tom (Corey Lanerie, 8-1); Annual Report (Bravo, 5-1); Rated R Superstar (Calvin Borel, 8-1); Keeneland maiden winner and Street Sense sixth My Majestic Flight (Joe Johnson, 30-1); and Uncle Jerry (Mitchell Murrill, 30-1). All starters will carry 122 pounds. Airoforce will race with blinkers on, while Uncle Jerry takes the blinkers off. Saturday’s National Weather Service forecast for Louisville calls for an 80-percent chance of showers with a high near 54.